Rapid eLearning solutions for MAXIMUM impact in MINIMUM time. 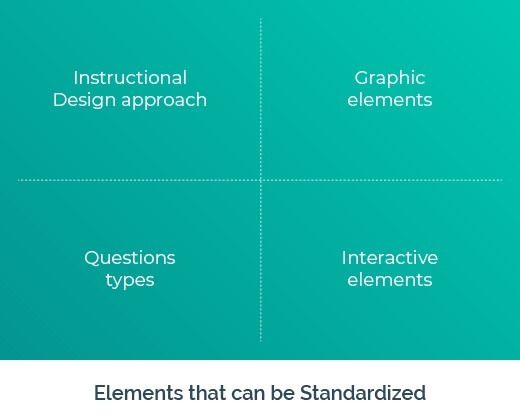 Sound instructional design for high quality courses on a large scale. eLearning Champions are NOT armchair learning gurus. Your job delivers business results. You need to train your employees so that their time to proficiency is minimized. Line managers expect results from our training in terms of improved Sales, Efficiencies or Compliance. They want training to be delivered “yesterday”, and are quite particular about how much they pay for it. They are not impressed with the bells and whistles in an eLearning course – only by the results your training produces. And you can do all this with rapid eLearning design and development. According to the great marketing guru, Ted Levitt: if a product doesn’t sell, it is not a product. It is a museum piece – great to look at, but of no real use. It is tempting to build a “Taj Mahal” of an eLearning course that may win awards (costing a fortune and months of production time), but deep down, you know that it doesn’t justify the humongous cost, time and effort in terms of improving employee performance. 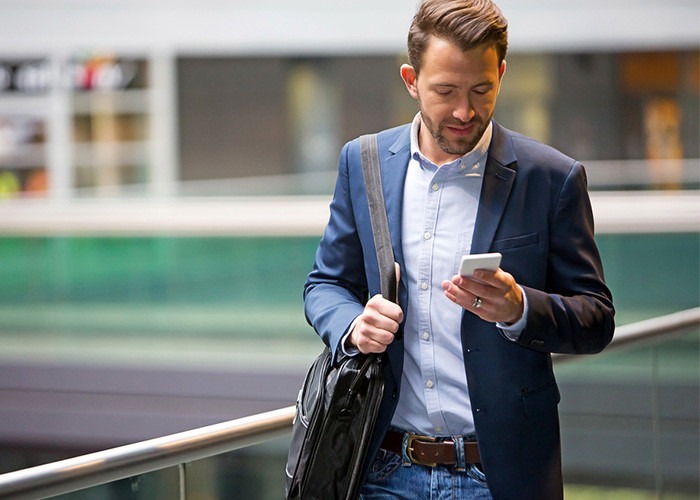 If you want business results fast, you need to cut to the chase, whittle down to the critical basics and invest in rapid eLearning solutions. Make your stakeholders and Mr. Pareto happy! 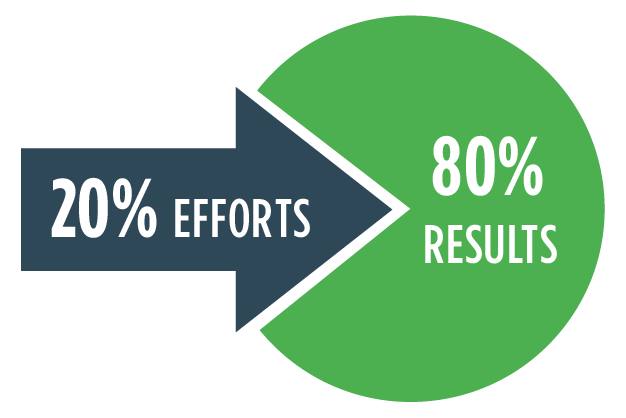 The Pareto principle or the 80/20 rule states that about 80% of your results come from 20% of your efforts. Rapid eLearning doesn’t mean compromising on the interactions, visuals, or quality. It is just the ‘right dose’ of instructional design to deliver courses within timelines. The Learning Stratosphere is inundated with newfangled eLearning strategies – most of them appropriate for only a few training scenarios. In most cases, they’re not very useful, and almost always too costly. For learning to be effective, you just need to stick to 5 fundamental principles. Rapid eLearning’s instructional design is “fast and right”. It is utilitarian, appropriate, and highly effective; and to top it all off, it is great value for money. 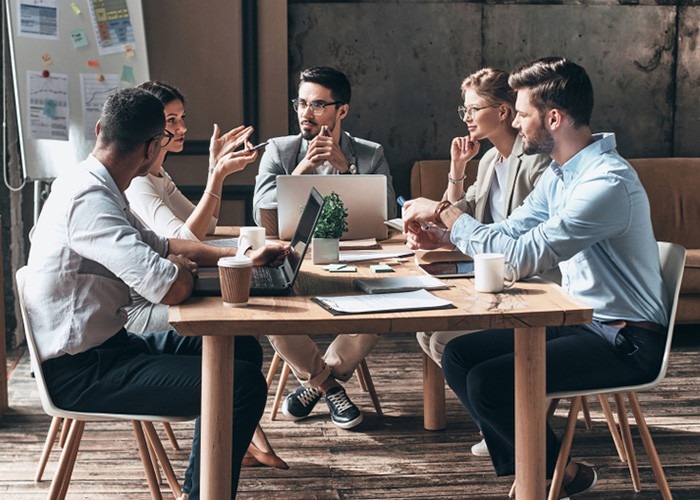 Your stakeholders – Sales Managers, Operations Heads and Legal Counsels – operate in extremely dynamic and challenging conditions, under very tight deadlines. Research shows that rapid eLearning solutions can be delivered in 30% of the time taken by conventional training methods. Faster training leads to faster results. Your business operates on different fronts and requires a variety of training interventions, which change and evolve by the hour. To turn out multiple eLearning courses or curriculums to address disparate training needs, rapid eLearning is the key. 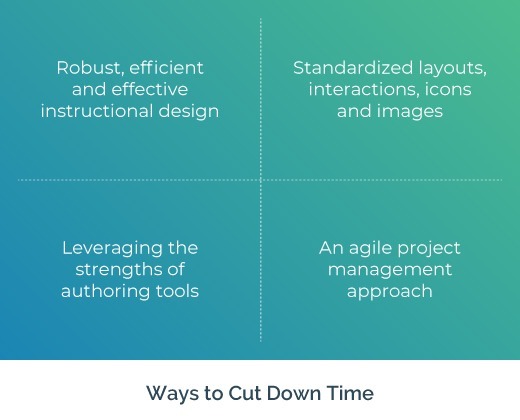 Designing and developing a large number of courses against a tight deadline is only possible by standardizing elements across curriculums. eLearning design and development is a process that is both creative and mechanical – ‘creative’ instructional and visual design and ‘mechanical’ course development. Because the process is creative, it’s difficult to envisage what we want to see in the final course when we’re just starting out. Only when we see the work in progress, we get ideas to improve and can enhance the design iteratively. This does not work well with the traditional ADDIE model because of its linear nature. Design changes during course development will lead to time and cost overruns, because most of the cost is incurred in the production phase. 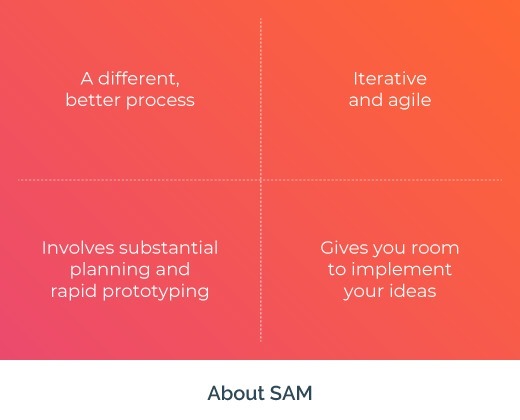 Based on 18 years of eLearning project management experience working with global customers and remote stakeholders, CommLab India has adopted the iterative and agile Successive Approximation Method (SAM). 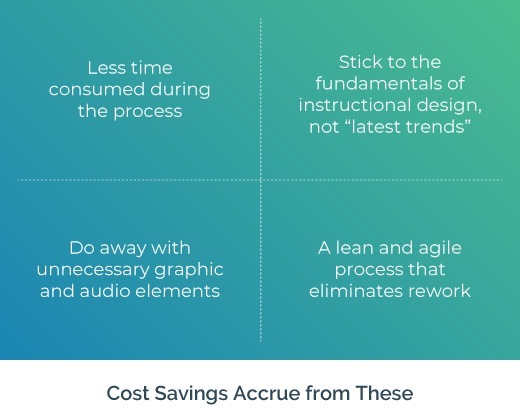 Rapid eLearning Design and Development can lead to a 30-50% jump in your ROI without negatively affecting learning efficacy, as it focuses on the essentials while jettisoning the superfluous. CommLab India’s rapid eLearning solutions have delivered maximum returns on customers’ investments. 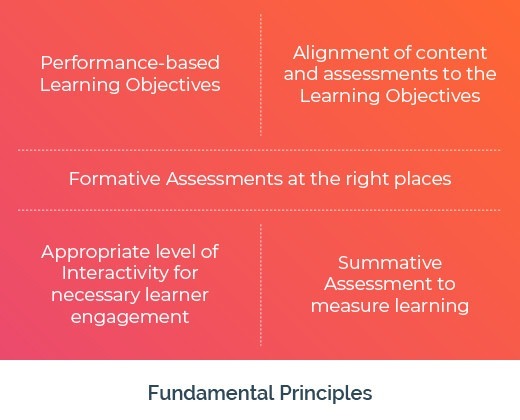 Designing and developing eLearning curriculums from classroom training/ Instructor-led Training material in the form of PowerPoint decks, facilitator guides and participant handouts. 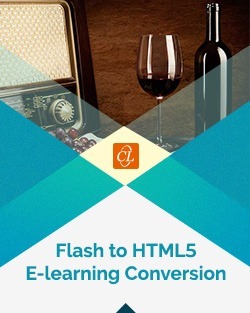 Upgrading content, visuals, interactions and assessments of legacy eLearning courses built in obsolete authoring tools such as Flash. More importantly, converting them into HTLM5 so that they can be delivered on to handheld digital devices such as tablets and smartphones. 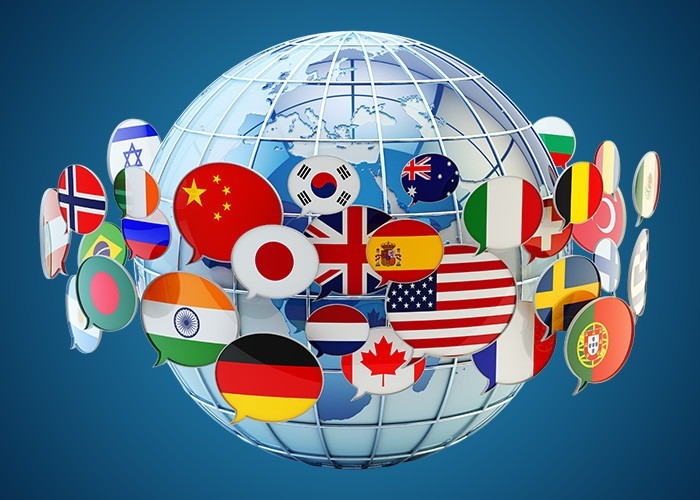 Translating the master English language eLearning course into multiple international languages for your global audience. This includes translating the content (text and audio) into the target languages, replacing the English content with the translated content and republishing the course using rapid authoring tools.